Arriving at the club this morning I found out it was occupied by a triathlon circus – no club facilities for the members, everything reserved for the triathlon intruders – so I had to return home. Next time also I will be using the mast that came with it. It is after all 100 mm longer than the one from Minisail 9000, and I think it will be a gain in comfort during maneuvering with the boom 10 cm higher up. Oh and yes, I’ll paint the hull. The Mrs thinks the scruffy look doesn’t do justice to the lovely old wooden boat. She might be right (and it needs at least one other coat anyway). Went out to sail the Meson for a first time this afternoon; It went fine. Would have been happy with less than 13 to 15 knots to try out the unfamiliar and freshly refurbished boat but it didn’t rain and the wind was warm coming from South; Things could be worse. Basically the rigging of the Meson is quite identical to my other boats so little surprises there – Except for the few odd bits of string missing on the new sail ,with some improvisation that was easily fixed. First impression of the boat unmanned on the water: it doesn’t keep it’s balance and falls over. My Monaco’s and Sprites did behave better on that aspect but would this be a good sign? I see moored light racing dingies tipping over all the time, hence would this be a sign of racing pedigree? Close hauled went surprisingly effortless but during the first seconds of sailing I soon felt no grip at all anywhere for the feet. A slippery floor and no edges to brace against. So I couldn’d move to a good position on the seat and sit out properly. Beam reaching (with a brand new sail!) in 4Bft was fun. Instant lift off and enjoy the ride. Spray as much as you can handle, this is a very wet boat. On one occasion I stopped to get the main sheet sorted and unwillingly the boat got head into wind … not easy to get out of. I suddenly remembered my days with the Monaco with the same veed hull. The flat bottom ones recover far more easy. 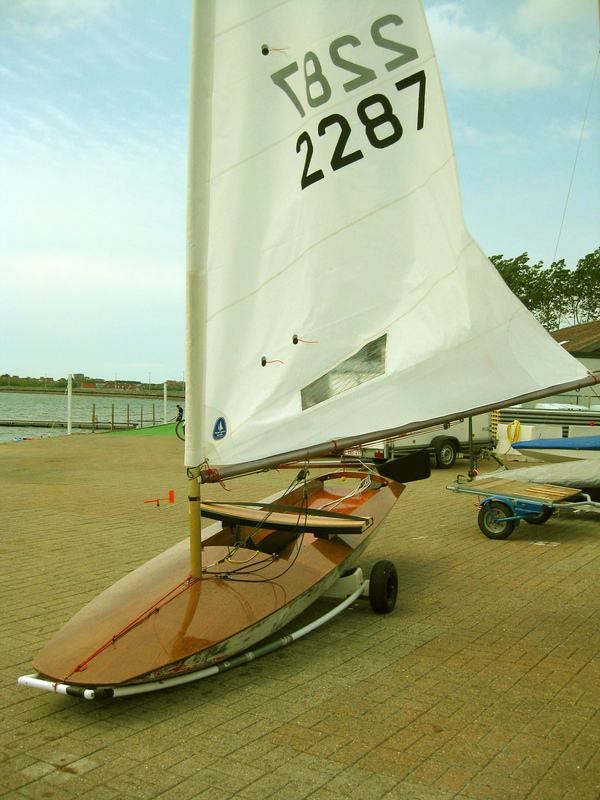 So in all yes this is a good Minisail variant: It’s light, doesn’t drag it’s tail in the water (so I won’t need to mount transom flaps), it has a cockpit and seat, it flushes any water coming in out and it’s wooden: Perfect! Next weekend we’ll be saliling the Europeans in Wormer Holland. Will have to mend the slippery cockpit, but once that’s done I will have a fine Minisail to do well there. 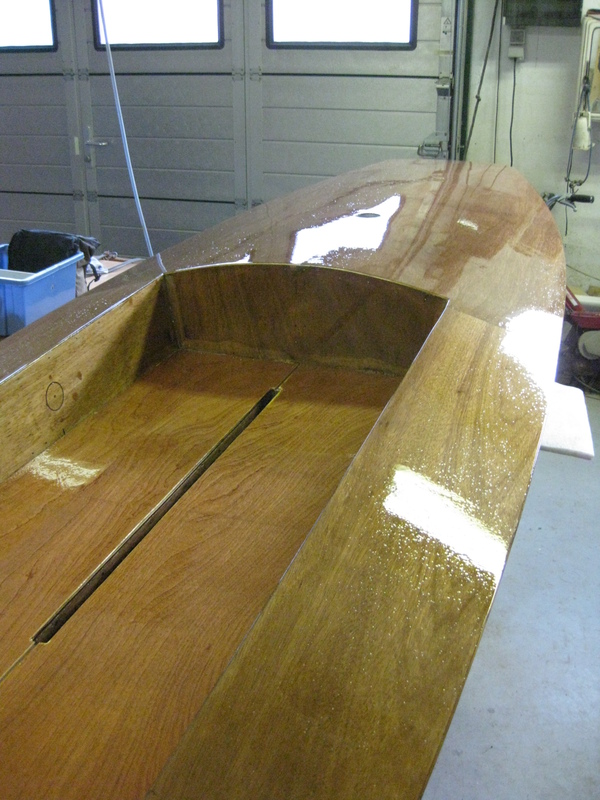 The hull is now varnished. Not to factory standards by far, but waterproof and fine for me. 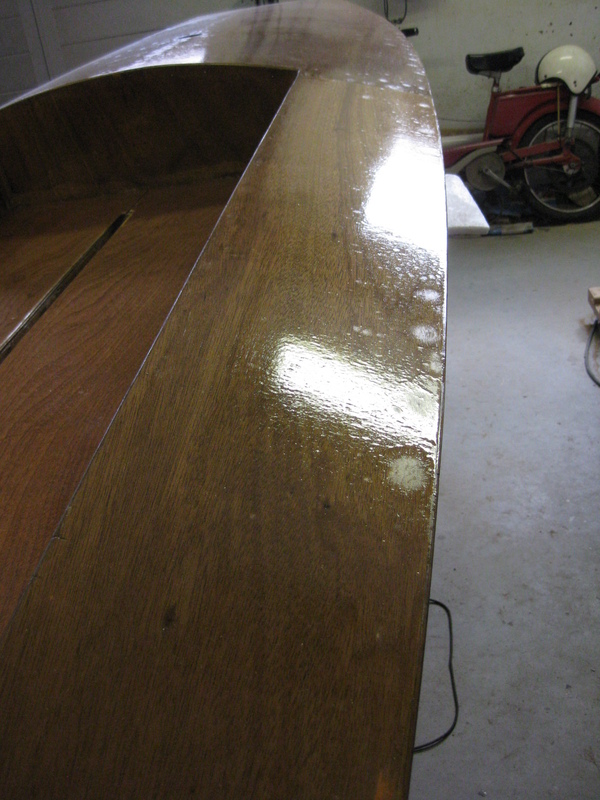 One coat of Poyester is more than glossy for the time being and to find out if this boat is good for sailing and racing. Only the fittings need to be re-installed and the inner-edges to be filled and she’ll be ready. Next post will be about how it is on the water! Removed all the fittings and gave the deck it’s last layer of epoxy. Weirdly the “varnish” doesn’t seem to cover the surface uniformly. The new wood is fine but in the areas of the old wood where nails were hammered the varnish seems to be repelled. 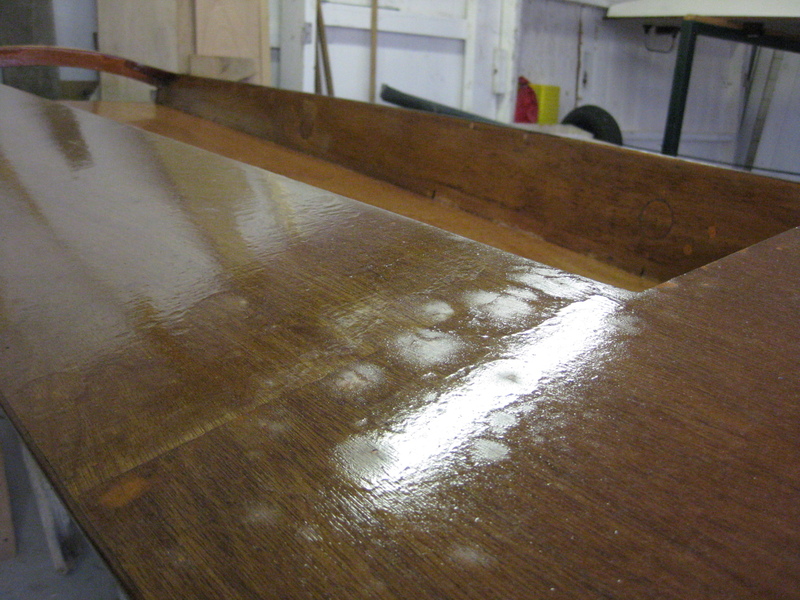 I’ll now gently sand the hull once more and will apply the UV-proof polyester varnish just after cleaning it with some white spirit. Let’s hope for a better result. Remember I wasn’t that happy with the new wooden rudder assembly I made? I decided to buy a new aftermarket Laser ruder headstock and look here is how it looks like on the transom of the Meson. Some will feel it’s blasphemy. Me, I think if Minisail transoms would measure the 100mm height required, most of them would by now have swapped the floppy wooden one for a Laser stock. Sadly the Meson is the only Minisail variant that has a transom +100mm high, so the Laser rudderstock is not an option for the majority of Minisails. 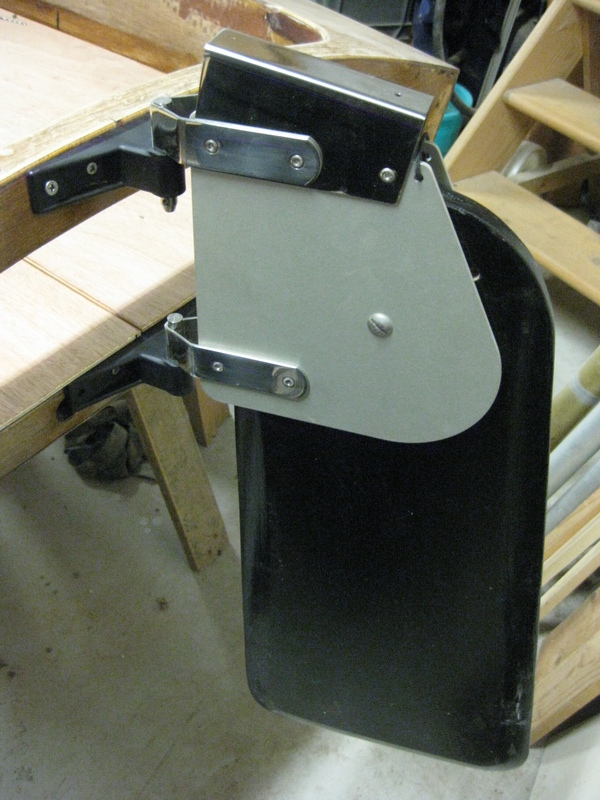 The rudder blade for the wooden stock fitted just fine into the new one after re-drilling the centerhole. Am I happy with this item? Not yet, it needs some getting use to I guess. Let’s try it on the water first.